This beautiful child is battling with cancer. Her name is Maggie. 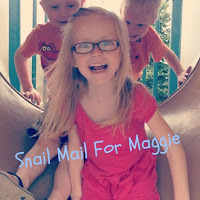 My friend, Kimberly, at Kimberly's Korner is trying to get 50 snail mail Christmas cards to cheer her up. I'm sending her one with a picture of Wendell. He's smiling in the picture, so hopefully, it will make her smile too. Please visit Kimberly and join in. Also, let's keep this brave little girl in our prayers. Thanks with a big hug! I will be happy to send Maggie a card and also keep her in my prayers. Thank you for sharing. Bless her heart. I often think I have troubles until I read something like this. Thanks for letting us know her wishes!!! Will do! Praise God for little girls like this. They show us the true meaning of strength and courage. Even though there are times they are afraid or sad. I would love to! Thanks for the Link, Patrice and Wendell! I made a card for Maggie... and it will be on it's way to Kimberly tomorrow. I'm also putting up a post about the project. Thanks for sharing this. Patrice, count me in; headed there now.